What says "it's a celebration!" better than a bowlful of pancit? 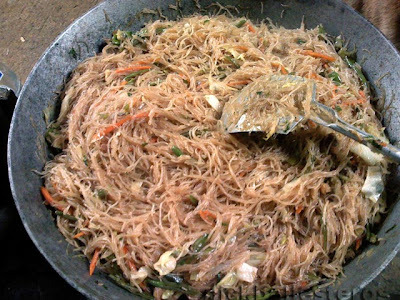 Though it's a tradition that can be traced back to the Chinese, pancit and its varieties has become an integral part of Filipino tradition. Birthdays are the more popular event for pancit preparation; the noodles are uncut to so that the celebrant can have a good, long life. 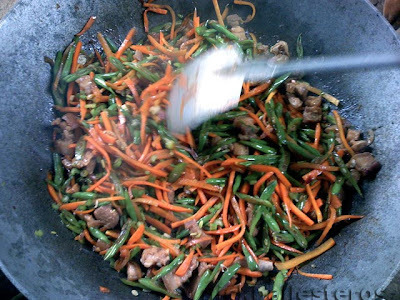 Pancit is best cooked on a wok, because it has a lot of ingredients and mixing them all together is easier in it. We prepared Pancit bihon last weekend for a double celebration: my nephew Kyle's birthday, and Mother's Day! Isangkutcha ang pork. This is done by putting the pork into the work, then pouring water until it just about submerges the meat. Cook in medium to medium-high heat, until all the water evaporates. The pork will give off its own oil. Lower the flame and mix the pork, cooking in its own oil but you may add some cooking oil if needed. When done, set aside. Pour cooking oil (about four tablespoons) into the wok. Tip: Although you can add the bihon and water directly into this mixture, my mother separates the cooking of the veggies from the noodles because the continuous mixing can crush up the veggies and overcook them. 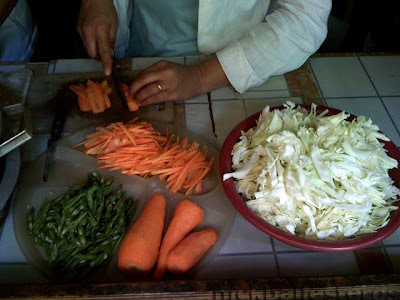 Once the bihon is cooked, mix in the vegetables. Add soy sauce to taste. Serve with sliced calamansi. Kainan na! Favorite ko rin ang pancit bihon lalo na pag kakainin mo ito na nakalagay sa dahon ng saging at hahabhabin (just like the famous pancit habhab ng Quezon). Sarap yang pagsaluhan sa Mother's Day at tipikal na handa rin sa mga kaarawan. 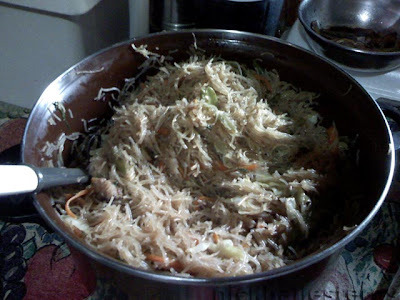 Pancit is also a well loved "handa" in many of our family celebrations especially birthdays. My son prefers pancit than pasta. I love pancit in any form - bihon (i like it dry), canton (with TONS of veggies -- I cook it with leftover chopseuy), palabok (FAVORITE!)... Ahh, pancit. Malaya: Minsan pa lang ako nakakatikim ng pancit habhab. Kakaiba sya! Rach: Uy, Yohan loves pancit! Mas ok yun kasi maraming gulay, diba? Nina: Ako rin, nagutom sa description mo. sardines. kahit papano eh nai-celebrate namin yung birthday nya.